Yesterday, at Caesarea, we saw ancient innovations around water and at Emfecy, modern day alchemy, to make sewage into water. Today, our first stop, after leaving Haifa, was the Atar Sapir- Mekorot Pumping Sation. The site has high strategic importance to the state of Israel. Below is the only picture I was allowed to take. Armed guards met us at the front gate and escorted us. 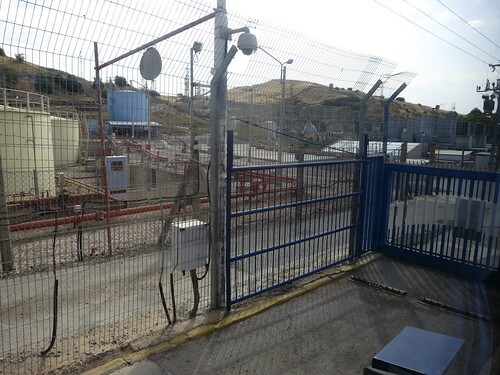 Throughout the tour, we realized why the security was tight - Atar Sapir is vital to the supply of water in Israel. Yesterday, at Caesarea, we saw ancient innovations around water and at Emfecy, modern day alchemy, to make sewage into water. Today, our first stop, after leaving Haifa, was the Atar Sapir -- Mekorot Pumping Sation. The site has high strategic importance to the state of Israel. Below is the only picture I was allowed to take. Armed guards met us at the front gate and escorted us. 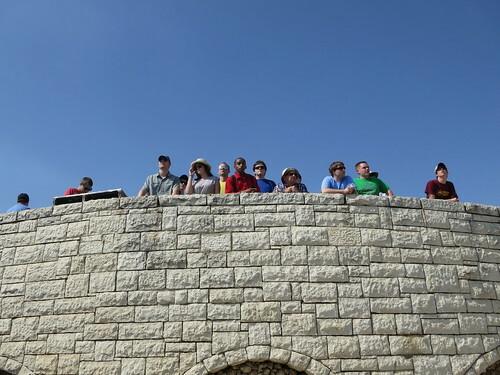 Throughout the tour, we realized why the security was tight - Atar Sapir is vital to the supply of water in Israel. Northern Israel contains the majority of the freshwater and aquifers in the country. Leaders realized, early in the Zionist movement, that providing freshwater would be key to producing successful crops in the south. Atar Sapir -- Mekorot Pumping Station was originally a top-secret project to fulfill this need. The Syrians did not want the Israelis to create a pumping station because the most logical spot, in the mountains, would divert tributaries that, down stream, meander into Syrian land. International law protected the Syrian viewpoint. Therefore, the Israeli's decided to pump the water from the Sea of Gailee(Lake Kinneret). In addition, the Golan Heights(Syrian land at the time) border Kinneret. Therefore, the station would need to be in the mountain for protection and secrecy. The project at Atar Sapir cost 7% of the GDP -- a staggering number. The water at Atar Sapir, unlike most pumping stations, is pumped upwards rather than downwards to get to customers. Three powerful pumps, each consuming 30 Megawatts, force the water up to a holding lake. From there, the water flows downhill, though pipes, canals and reservoirs, toward the big cities and farmland. The site was quite massive and included one of the biggest siphons in history. Most of the engineers in our group were "geeking out" on the tour. 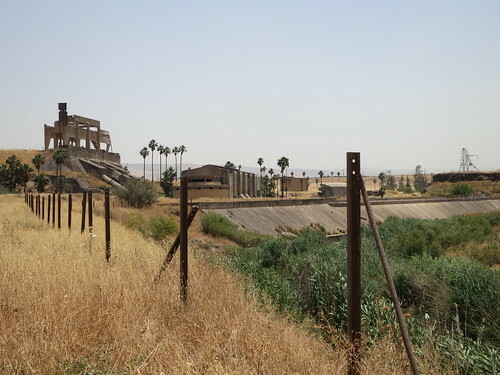 The Naharayim Hydroelectric Plant is our first example of the complexities of the politics in the middle east. However, the subtle influence of politics has shaped our experiences this far. Nonetheless, this is our first site visit that direct address the impact of these issues. In 1932, the power plant and surrounding dams were completed, under the British rule of Palestine. It was the first hydro electric power plant in the country and largest power plant in Palestine at the time. The power plant produced 75% of all the electricity in Palestine upon competition. The city of Naharayim grew to support the workers of the plant. In 1948, during the 6 Day war, Jordan capture the facilities. At that time, the dams were blown up. In addition, the Israeli's destroyed the bridges along the Yarmouch River. The border, in the following crease fire, was drawn through the lake placing the majority of the facilities in under Jordanian rule. In 1994, a peace treaty was signed that allowed Israelis an enclave on Jordanian soil for Tourism and agriculture. 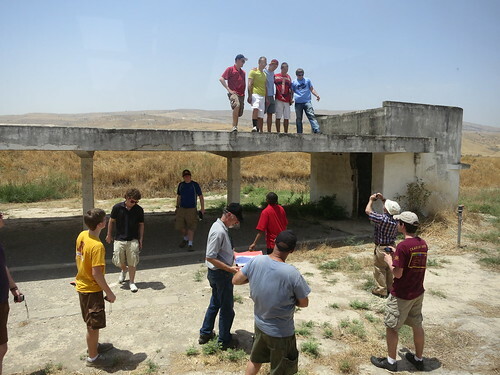 We visited the dams and crossed in Jordan. However, the power plant itself was outside of the enclave section of the city of Naharayim. The startup ethos of dreaming big is realized in the crumbling structures of the massive plant. At the same time, this city shows that these dreams exist in a fragile region where politics rule. After a lunch of falafels we headed down Route 90, along the Jordanian border, to Jerusalem. We passed through the West Bank without any incident. The number of Israeli settlements along the route surprised me. The route took a big, semi-circular, turn to avoid Jericho. From the distance, Jericho looked like an oasis in the middle of the desert. We continued on to Jerusalem, after the detour. 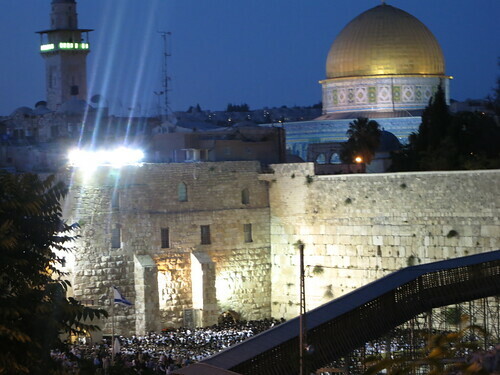 Once in Jerusalem we went to the Western Wall just as the Sabbath started. I do not have the gifts to accurately write about the experience - this is something to as one of us when we return.